2018 Classic Superbike TT Race Result—Dean Harrison, riding a Silicone Engineering Kawasaki, dominated the RST Superbike Classic TT Race to win the final race of the 2018 Classic TT presented by Bennetts, his fourth Classic TT win, by over a minute. 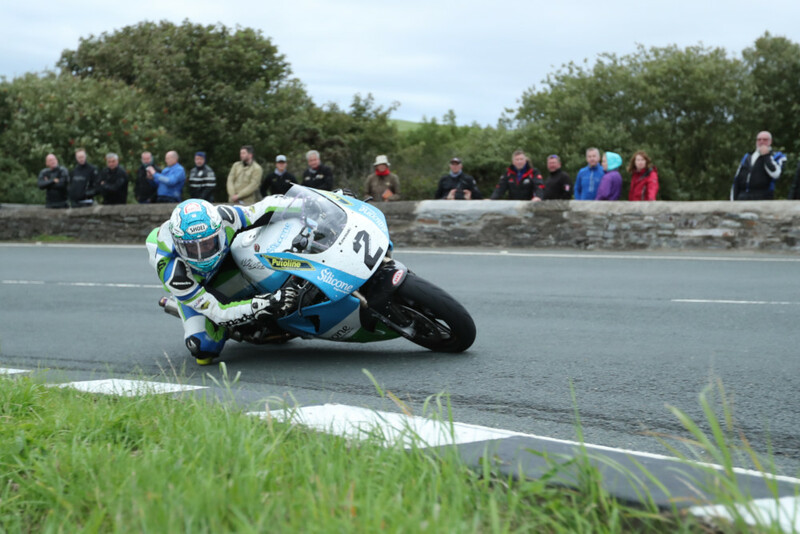 Dean Harrison at the Gooseneck during the RST Superbike Classic TT Race. 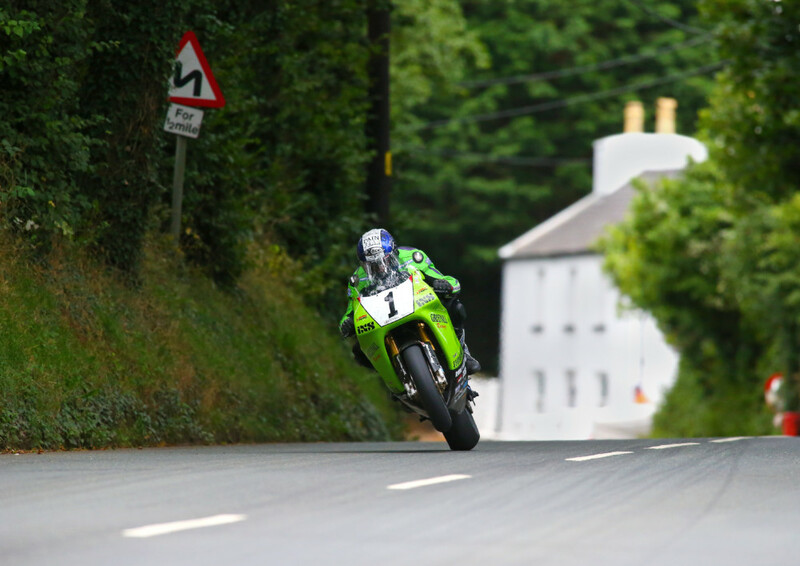 Greenall Racing’s Horst Saiger had the honor of carrying the number 1 plate and was first away followed by Harrison, who had only qualified for the race as third fastest but had set his fastest qualifying lap on the opening night. James Hillier, due to start fifth on the Oxford Products/ Louigi Moto Ducati, pulled off the grid after his bike was overheating and eventually got going about eight minutes behind the leading riders while Josh Brookes, on the Wiz Racing Norton, was also reported to have problems on the grid in 11th place and eventually started six minutes after the first rider got away. Saiger tried all he knew but couldn’t stop the rampaging Harrison. Harrison established a lead of just over two seconds over Gary Johnson on the Team York Suzuki by the first timing point – Glen Helen – with Michael Rutter on the Team Winfield Yamaha third a further two seconds back. Kawasaki mounted Paul Jordan (Mistral Racing) and Derek Shiels (Greenall Racing Kawasaki) completed the top five, just under and over a second back from third place, on the Mistral Racing Kawasaki and Greenall Racing Kawasaki’s respectively. 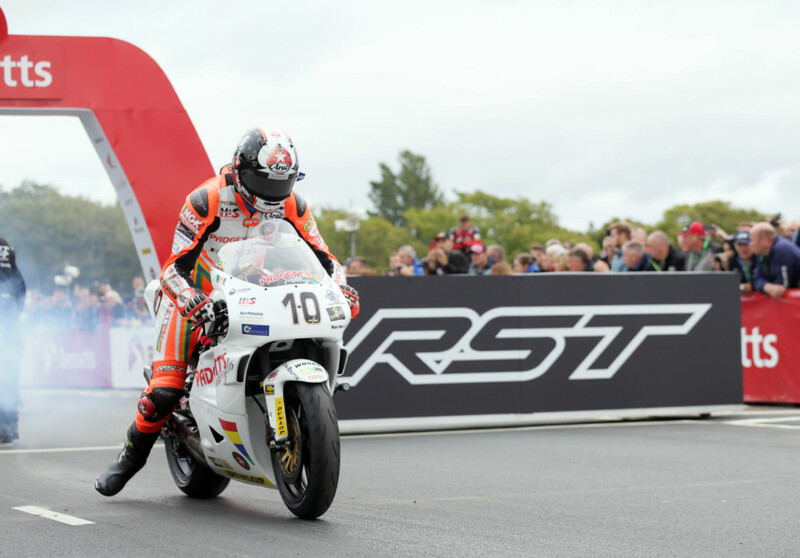 Harrison’s opening lap of 125.471 gave him a lead of over nineteen seconds from Michael Rutter (123.309) with Gary Johnson (122.980) in third almost three seconds behind Rutter. Conor Cummins, riding the two-stroke Yamaha YZR500 had moved into fourth place, less than half a second behind Johnson, with his opening lap of 122.929 with Saiger (122.247) completing the top five. Josh Brookes (121.380) had moved through the field to eighth place, half a minute behind the race leader, at the end of the opening lap. Cummins edged ahead of Johnson at Glen Helen on the second lap and with Rutter retiring at Ballacrye, Cummins moved into second place at Ramsey, over thirty seconds behind Harrison with Johnson holding third, one and a half seconds down on the Manx rider. Connor Cummins smokes his way off the line with the factory Yamaha YZR500 two-stroke. Coming in to the pits at the end of the second lap, Harrison’s 126.041 gave him a lead of 37 seconds from Cummins but with Cummins (1:15.912) and Johnson (1:14.834) both experiencing lengthy pit stops – and Johnson’s subsequent retirement at Quarterbridge – Saiger moved into second place at Glen Helen on the third lap. Paul Jordan and Andrew Dudgeon completed the top five, eighteen and twenty-three seconds down on Cummins respectively. Josh Brookes, having worked his way through the field up to seventh, lost time before Cronk Ny Mona and was reported as a retirement in the pits. Harrison’s extended his lead over Saiger to almost a minute with a third lap of 118.013 with Cummins over ten seconds behind Saiger. 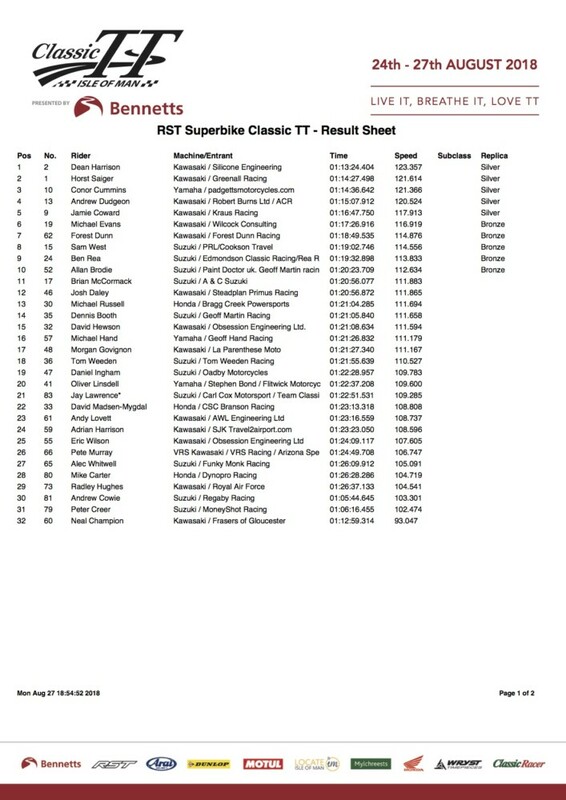 Jordan and Dudgeon completing the top five with third laps of 115.499 and 116.034 respectively. Harrison duly secured the race win with a last lap of 124.238mph from Saiger (123.560) with Cummins clinching the final podium place with his last lap of 123.832 – almost ten seconds behind Saiger. Dudgeon moved ahead of Jordan on the last lap with Jordan experiencing problems and – with Jordan reported to have retired at Handley’s – Jamie Coward moved into fifth place.